Arkvilla is a beautiful 4 bedroom, 3 bathroom holiday home with private pool and games room. You feel at home as soon as you walk in the door. We do our best to make sure Arkvilla stands out from the crowd. Spend quality family time enjoying a fantastic holiday in a beautiful home, Arkvilla is the perfect choice. A warm, welcoming home for guests who value a quality home. Everything has been hand chosen to add to the ambience of our home. Our wonderful Florida home has everything you need for the perfect stay, as you walk through the front door you feel right at home. The beautiful Lounge is elegantly furnished in gold & cream, a relaxing room with a bright, airy feel which uplifts your spirit. The large open plan Family Room is also furnished for comfort and relaxation. A 50" flat screen TV is the central focus, the family room looks out on to the private pool area. With free Wifi it's a perfect room to relax in after busy days at the theme parks. The kitchen is bright and airy with lots of counter space and comes fully-equipped with a full-size oven and hob, refrigerator/freezer with ice- maker, built-in microwave oven, dishwasher, waste disposal and telephone, everything you need for cooking a meal or enjoying a take away. Wifi and IPod dock are provided for your convenience. The spacious Master Bedroom, with En-suite, is beautifully decorated. It has a queen size bed, large walk-in closet, flat screen 32" cable TV, safe, radio alarm clock and hairdryer. The fabulous en-suite bathroom has his and hers inset hand basins, large walk in shower, corner bath and separate toilet. The second Master Bedroom also has en suite facilities with queen sized bed, flat screen cable TV and large closet with plenty of hanging space. There are 2 further Twin Bedrooms with large closets which share the Family Bathroom. 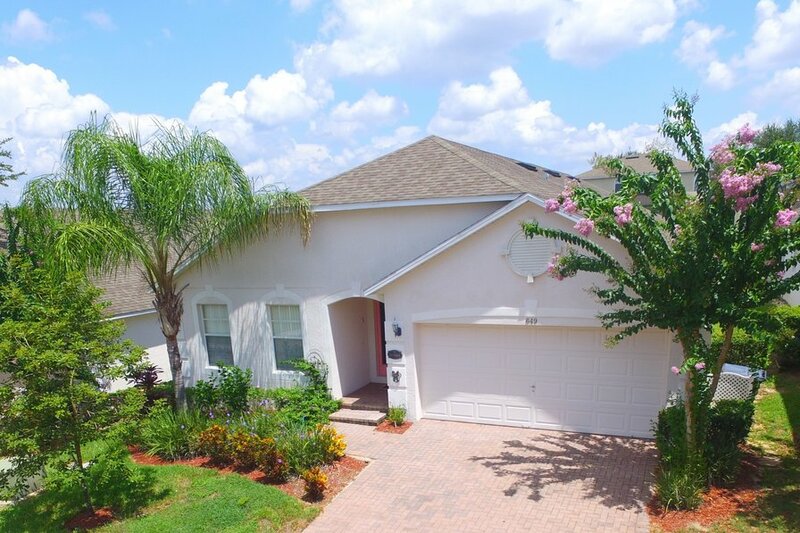 HIGHGATE PARK is situated close to Disney in Davenport, Orlando, Florida on Highway 27 between the 192 and I4 which makes it the perfect location to easily get to all the major attractions, shops and restaurants. We are the only Gated Community on the Villages of Legacy Park and employs a Private Security company not only to help give you peace of mind during your stay. Easy access to either the Gulf or the Atlantic coasts with beautiful beaches and the chance to explore the whole of Florida. This exclusive ‘5 star’ Park is maintained by one of Florida’s leading Landscape Companies who also look after the grounds of each individual home within the Community ensuring local flora is used to maintain the natural ambiance. With Champions gate Golf course and many other renowed courses within a 10 minute drive, Arkvilla really is an excellent base to see what Florida has to offer.